Our team has worked on several ESRI/ArcGIS mapping projects providing our clients with data driven applications utilizing maps for efficiency, data management, geographic specifications and more. We have taken it a step further by building custom web applications that work hand in hand with our maps to provide additional User Features and capabilities. Solutions also include Administrative management tools for data a reporting capabilities for our clients. These solutions have been built using .NET, C#, SQL and others. Each solution being customized for our clients, organizational goals and target audiences. 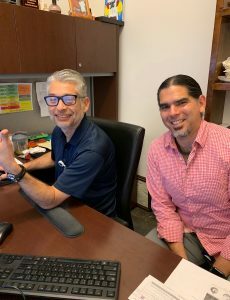 The teams have been led by our CIO and Senior Programmer Bill Gonzalez and Carlos Laurel and managed by our Program Manager, Melissa Adame. This team has worked on multiple high level successful federal and commercial projects. If your organization has a need for an Interactive Map to display locations, geographic data; give us a call. Our skills range from custom Google maps to sophisticated ESRI/ArcGIS solutions.